Four years ago, Katie Davis was homecoming queen at her high school in Brentwood, Tenn. She had a yellow convertible and planned to study nursing in college. But those plans changed just a little. 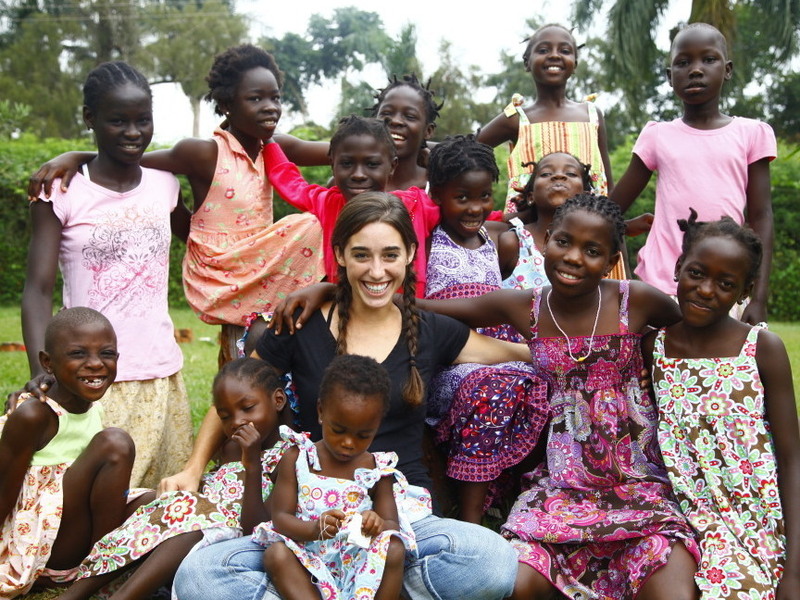 Today, she’s in Uganda, sharing her home with 13 orphaned or abandoned girls, ages 2 to 15. Davis is the legal guardian or foster mother for all of them, and hopes to one day adopt them. Davis traveled to Uganda after her high school graduation in 2007, but saw it as a temporary move before starting college back in the United States. She started teaching kindergarten at an orphanage in a small village near the town of Jinja. One night, in January 2008, a mud hut down the road from the orphanage collapsed on three small AIDS orphans during a rainstorm. One of the girls, Agnes, then 9 years old, was taken for medical treatment. “I was in the hospital, and I asked Mommy whether if I can live with her, and she said, ‘yes,’ ” Agnes recalled. Davis couldn’t find any living relatives willing to take any of the girls, and she refused to send them to an overcrowded orphanage. Davis then rented a house to accommodate the three girls. Over the next 18 months, 10 more girls moved in. All had been abandoned or abused, or had watched their parents wither away from AIDS. The youngest girl, Patricia, now 2 years old, was literally given to Davis by an HIV-positive mother who had 11 other children. Getting those 13 girls to sit down at the breakfast table is just the first of many hurdles Davis faces daily. Davis is well-known in Jinja, where she drives her family around town in a 13-passenger minivan. She can apply to formally adopt the girls after serving as their caregiver for three years. But not everyone supports her. By law, Davis is too young to adopt in Uganda, said child welfare officer Caroline Bankusha. The rules say an adoptive parent must be at least 25 years old, and at least 21 years older than the child being adopted. Apart from the age issue, Bankusha also disapproved of Davis taking care of so many children. “Unless the children are placed under a children’s ministry or children’s home, which she can start, otherwise it is really bad for someone to have more than five children,” she said. Davis said she has done everything by the book and is the court-appointed caregiver for all of the girls. The oldest girl, 15-year-old Prossy, says it’s certainly in her best interest to stay with Davis. Davis has also started a nonprofit organization called Amazima Ministries. With support from U.S. donors, Amazima helps 400 children go to school, provides community health programs and feeds more than a thousand children five days a week. Davis is the director, and the job supports her and her family. As she washed her two youngest girls in the bathtub, David explained why she has taken on so much. Even her own mother, Mary Pat Davis, had questions about what Davis was doing. Mary Pat Davis now visits Uganda for a couple of months each year to help her daughter care for the Ugandan girls. Katie Davis said she hopes to get married and have biological children someday. But right now, she has no plans to move back to the United States. She did return briefly in the fall of 2008 and enrolled in nursing college, fulfilling a promise to her parents. But she quickly realized she missed the Ugandan kids too much. She dropped out and moved back. At the end of another long day, Davis herded her girls off to bed and tucked them in, providing a glimpse of why she has stayed. “I love you, Mom,” said one of the girls.